Coriander is the dried ripe fruit of the herb Coriandum Sativum, commonly known as cilantro or Chinese parsley. The round, ridged seeds are dark tan in color and they carry a sweetly aromatic flavor reminiscent of lemon and sage. Coriander is ultimately versatile, flavoring everything from the sweet to the savory in North American, North African, Mediterranean, Mexican, Indian and Southeast Asian cuisines. Discovered in ruins dating back to 5000 B.C., coriander is believed to be one of the first spices used by mankind. It was also referenced in Sanskrit writings and the Bible's Old Testament, where manna is described as being "white like coriander seed." As civilizations grew, so did coriander's popularity. The Romans spread it throughout Europe and it was one of the first spices to be brought to America. 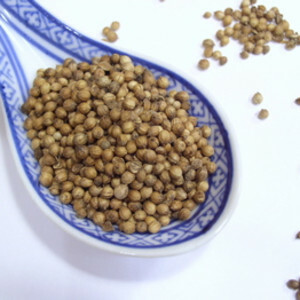 Coriander is available in whole seeds or ground, but the ground form loses flavor and aroma rather quickly. The brittle whole seeds can be easily ground at home right before adding to recipes for the freshest flavor. Less widely available are coriander roots, which are favored in Southeast Asia for scenting soups and making curry paste. Whether whole or ground, store coriander in an airtight container away from light, heat and moisture. Whole seeds will keep for up to a year; ground coriander will deteriorate faster and should be replaced when color and aroma start to fade. Add coriander to marinades, stews and chili. Give the seeds a light toasting in a dry fry pan before using to release oils and increase flavor. Combine toasted coriander, cumin and fennel seeds to make a dry-rub for meats. Add ground coriander to gingerbread, banana bread and carrot cake batter. 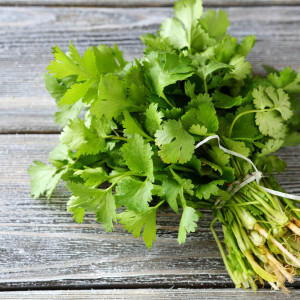 Recipes calling for "fresh coriander" are actually referring to cilantro, the green leaves of the coriander plant. When coriander is not available, fennel or anise seeds can be substituted in most recipes. Cilantro has a light citrusy flavor. Coriander is the ripe fruit of cilantro.